Olympic Cottage is a quiet, pristine, 1200 square foot, rambler style, 2 bedroom, 2 bath, cozy getaway in Sequim, WA. Private 9 hole golf course provides privacy to relax and unwind. LONG TERM (28 nts) DISCOUNT IS 30%! Long term guests welcome; reduced rates and security deposit apply to monthly. The cottage boasts: Sunroom surrounded by views of the private golf course with wandering deer. Outdooors: Deck off sunroom, gas BBQ and firepit in yard. Master Bedroom with medium firmness king bed and jetted tub in attached bathroom, 2nd Bedroom w/ firmer queen bed with memory foam topper and lodge decor. Dining room overlooks sunroom. Well-equipped Kitchen, comfy recliners. Fireplace, new HD TV, WiFi, Netflix, Cable TV, Deck w/gas BBQ off Sun room, Enclosed, 2 car garage & Laundry Room. Local attractions: Beaches, Parks, Shopping, Museums and Galleries, Golfing, Farms and Gardens, Kayaking, Bird and Elk Watching, Biking and Hiking, Wineries, Hurricane Ridge, and the Olympic National Forest. About the setting: Olympic Cottage is nestled in Dungeness Meadows within walking distance to the Dungeness River, but protected by a walking path on the dyke. Sequim is well known for its Mini Banana Belt warm and dry weather, is full of sights, sounds, smells, and vistas of the Olympic Mountains and the Strait of Juan de Fuca. Guests are very pleased with the level of privacy they enjoy. Resident deer often wander on the golf course, enhancing the relaxing environment. For cancellation policy, please read #25a of rental agreement. Patrick & I have enjoyed vacationing in Sequim with our 7 children and their families, for many years. We have loved the ocean since our honeymoon, when we stayed in a small cabin at Ocean Shores, 35 years ago. We have loved sharing this cottage with friends and family from all over the world. Quiet and Private. Long term renters welcome. Reduced rates available for extended stays. 30% less than stated rent. J1772 EVSE charging station in 2 car garage. Jetted tub is in the Master Bathroom (Shower also) Walk-in Shower is in the hallway bathroom. Hair dryer provided. Also some toiletries provided like shampoo and personal soaps. complete with grazing and frolicking deer! Simply set thermostat to preferred temperature & then heat or cool. Cooking & Baking supplies may include: spices, marinades and condiments. Some items in pantry may include things such as: pastas, rice, etc. Dinette for 4 Game cabinet with puzzles. 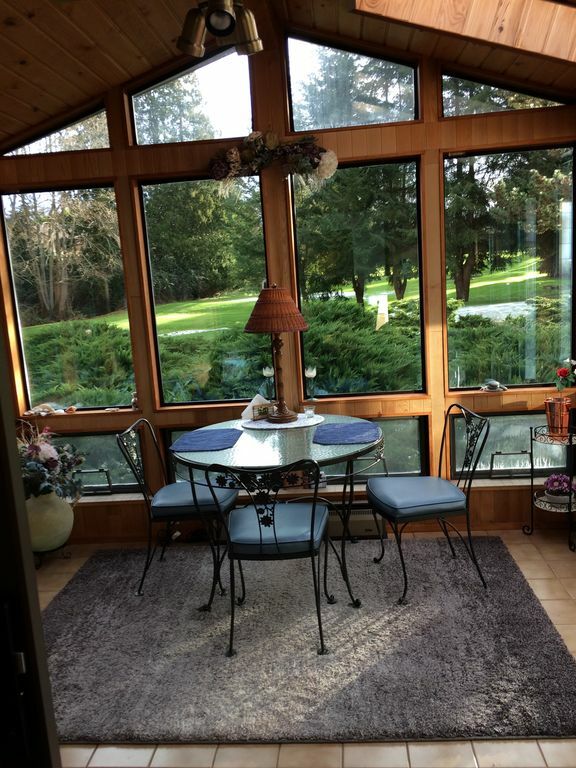 Has view of golf course through sun room. New 43" HD LED TV with cable channels and more. small area in back is fenced in and larger area in front is wide open. There's a small garden on the south side. For long term renters, if mowing and weeding is your therapy, we will waive $100 per monthly utilities fee upon written agreement. Great location- private, quite, safe, convenient to shopping and pints of interest in Sequim. Owner is friendly and helpful, property completely furnished for a comfortable stay; fully supplied with everything you need so no need to shop for any bathroom or kitchen supplies. Located near the rivers and bays from Sequim to the Olympic National Parks points of interest. Good location to rent a bike and rife the long scenic bike trail off the highway. Nice sunroom, deer roaming around, no traffic. The home was very clean and comfortable. It was easy to get to Sequim, Olympic National Park, and hiking trails in the National Forest and county parks. My husband and I stayed here for 2 months from late August through October, while we were relocating to Sequim. The kitchen was exceptionally well equipped and perfectly functional for cooking meals, and the fireplace was lovely to use on chilly Fall evenings. Even though there is no air conditioning, the home stayed very cool during the daytime, and the nighttime temperatures were consistently cool. There are neighbors on only one side, with the rear of the home facing a minimally used golf course, so the home was private and very quiet. We could hear the stream across the street at night when the windows were open. Paula was a pleasure to work with; she was attentive to our needs but never intrusive. I highly recommend this rental property. It’s wonderful to accommodate people like you. Welcome to Sequim! BTW, Sorry if I forgot to show you how to turn in the AC. We had a very nice time on the Olympic pen from this centrally located position, despite all the smoke in the air. My wife loved the sun room for her painting. We loved our stay at this beautiful, well equipped house. Close to town yet remote enough to feel private. We loved the sunroom and the deer that roamed to golf course behind the house. The owner obviously takes great care to make each visit a vacation to remember. Thank you for your compliments. We do our best and happy it’s appreciated. Superior hostess and dandy stay! Paula’s very nice and clean two bedroom, two bath home at Dungeness Meadows in Sequim had everything we needed for a three week stay. This superiorly equipped home had fast Wifi, Directv, washer/dryer, dishwasher, garage and everything imaginable that you could need. The house is located on a short nine hole golf course that is included in the stay. Communication was excellent and the stay was dandy. Thanks to Paula for providing a wonderful Christmas vacation including the snow for the holidays. Thanks for your excellent care of the house. It’s guests like you that make doing vacation rentals a joy. Thanks for the picture of the snowy scenery. We've stayed in 12 VRBOs and this is by far the most comfortable and best equipped. The kitchen and laundry room had all the supplies you could ask for. We appreciated the variety and quantity of comfortable furniture. The deck and sunroom were a real plus. Compare prices for a two bed/two bath rental and this is good value. We saw virtually no golfers but lots of deer in this lovely, quiet neighborhood. Paula was responsive and pleasant to deal with. Highly recommend this unit. We are always pleased to hear that our efforts are noticed. Thank you for taking such great care of things. Hope to hear from you again sometime. Children must not use golf course as a place to play. ID Badges are required for the use of pool and golf amenities. Thank you. Cancellation Policy: Deposit is refundable if booking is canceled before 30 days prior to check-in, less any 2.5% or other fees incurred by owner, which can be validated (proven) with bank statements. The person booking the cottage must be 21 or older and accompanying all other guests.